One of the most significant Beatles recording sessions took place on this day: the orchestral overdubs for A Day In The Life. John Lennon had suggested the use of a symphony orchestra to fill the song's instrumental passages, but was unable to put his ideas into adequate words. Paul McCartney suggested asking the players to build from their instruments' lowest possible notes to the highest, and George Martin was given the task of turning the vision into reality. What I did there was to write, at the beginning of the twenty-four bars, the lowest possible note for each of the instruments in the orchestra. At the end of the twenty-four bars, I wrote the highest note each instrument could reach that was near a chord of E major. Then I put a squiggly line right through the twenty-four bars, with reference points to tell them roughly what note they should have reached during each bar. The musicians also had instructions to slide as gracefully as possible between one note and the next. In the case of the stringed instruments, that was a matter of sliding their fingers up the strings. With keyed instruments, like clarinet and oboe, they obviously had to move their fingers from key to key as they went up, but they were asked to 'lip' the changes as much as possible too. I marked the music 'pianissimo' at the beginning and 'fortissimo' at the end. Everyone was to start as quietly as possible, almost inaudibly, and end in a (metaphorically) lung-bursting tumult. And in addition to this extraordinary of musical gymnastics, I told them that they were to disobey the most fundamental rule of the orchestra. They were not to listen to their neighbours. A well-schooled orchestra plays, ideally, like one man, following the leader. I emphasised that this was exactly what they must not do. I told them 'I want everyone to be individual. It's every man for himself. Don't listen to the fellow next to you. If he's a third away from you, and you think he's going too fast, let him go. Just do your own slide up, your own way.' Needless to say, they were amazed. They had certainly never been told that before. The session was recorded onto a separate reel of tape running in parallel with The Beatles' previously-recorded instruments and vocals. This required EMI's staff to create a technical solution to allow two four-track machines to run together. George Martin came up to me that morning and said to me 'Oh Ken, I've got a poser for you. I want to run two four-track tape machines together this evening. I know it's never been done before, can you do it?' So I went away and came up with a method whereby we fed a 50 cycle tone from the track of one machine then raised its voltage to drive the capstan motor of the second, thus running the two in sync. Like all these things, the ideas either work first time or not at all. This one worked first time. At the session we ran the Beatles' rhythm track on one machine, put an orchestral track on the second machine, ran it back did it again, and again, and again until we had four orchestra recordings. The only problem arose sometime later when George and I were doing a mix with two different machines. One of them was sluggish in starting up and we couldn't get the damn things into sync. George got quite annoyed with me actually. 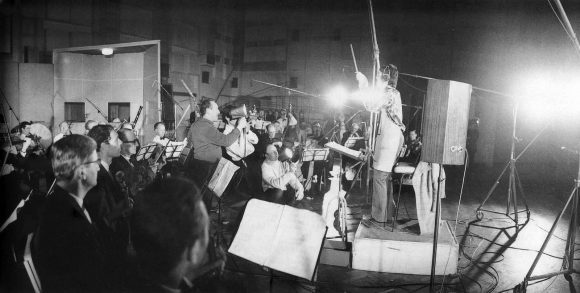 Having a separate tape reel running allowed for the orchestra to be recorded four times. It was then taped a fifth time, onto track four of the first reel, giving the equivalent of 200 session musicians. Paul McCartney conducted the proceedings in EMI's enormous Studio One. 'Oh, our usual freak-outs' – by which he meant their gaudy hippie clothes, floral coats and all. At the end of one of the performances – likely to have been the first – the musicians broke out into spontaneous applause.